1. My brother-in-law Nate designed these little book tags for the shop. The previous owner had her own tags and they were fine but definitely needed an update. Customers really like them – putting a tag in a book helps certain titles stand out for the reasons above. And they are so pretty. Thanks again Nate! 2. I wore sandals in February most of last weekend. 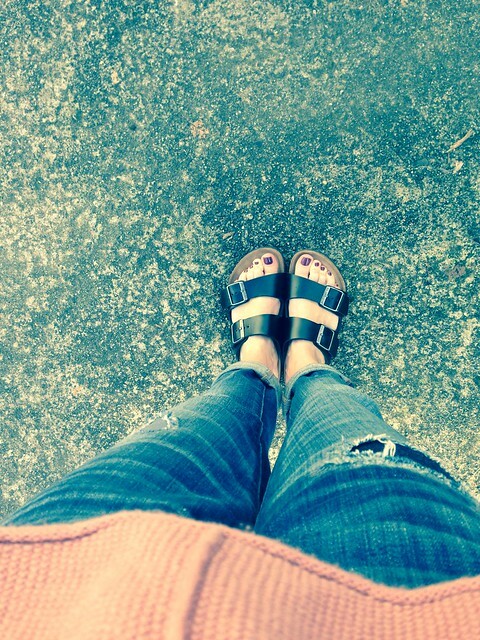 How I love the Birkenstock! They are having a moment but I will keep wearing them after the moment passes. And then ten years later, they will have another moment and I will appear stylish once again. 3. 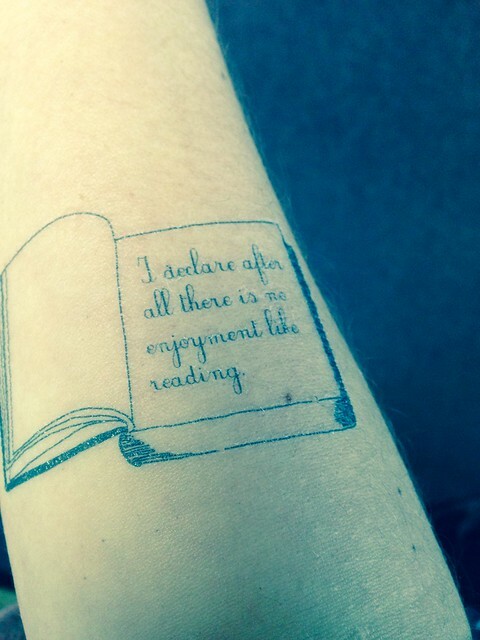 I have only taken terrible pictures of books this week (blurry, weird) so here’s one of a temporary tattoo…fun for a few days. But I did read the memoir The Chronology of Water by Lidia Yuknavitch at the Lake House last weekend. It’s maybe not for everyone but her writing is forceful and beautiful and difficult – I started the book and it was like I fell down a hole until I finished. Gripping and heartbreaking yet hopeful. I am also about halfway through Wolf Winter by Cecilia Ekback (A Powell’s Indiespensable selection) and am enjoying it. Kind of a literary mystery set in the Swedish Lapland. It’s deep winter in the novel and the juxtaposition between winter storms and our lightweight February is jarring. I know some of my East Coast peeps will roll their eyes at this but I was hoping for at least a little bit of snow this year. 4. 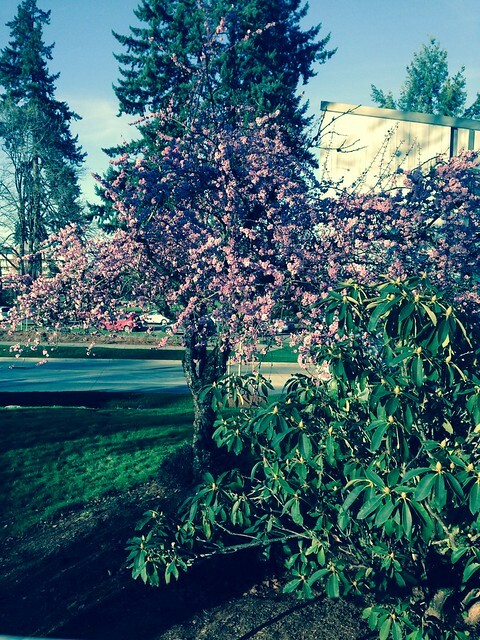 This is one of my favorite trees on the capitol campus any time of the year but how beautiful is it in this early Spring? I had a lovely walk with George down to the lake one afternoon this week which is always such a treat for both of us. Usually we do most of our walking during the weekend but Mendy offered to pick up both girls which left me free to walk. 5. I know I already posted this picture but it’s seriously such a favorite moment of my week. That whole day – President’s Day – was lovely. 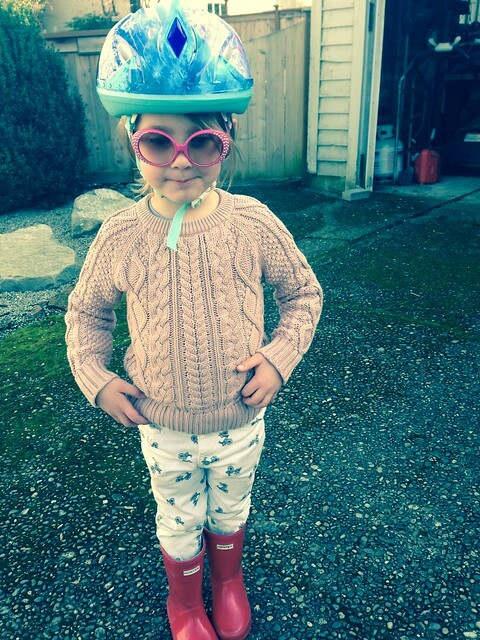 Cate riding her new bike, a walk in the afternoon light, watching George tear across the grass, and then this. Jane is just a goofball. Truly, a funny kid when she’s in her element. It’s my new phone background. And now it’s Friday again. Telfer and I have not eaten dinner together once all week and so tonight we are looking forward to Indian takeout and watching something. The girls have the pj party/parent’s night out at our gym which is one of the best nights ever. They love it, we love it. We are also in major prep mode for Phase II of the bookstore remodel – new counter area, new flooring, new lighting, more paint, and a railing around the balcony upstairs. So, obviously, we are headed to Ikea tomorrow for breakfast and good times in general. You are doing such an excellent job keeping up on your postings! 🙂 Love the five things on Friday. It’s always a perfect mix of you, family, books, food. Pretty much all the things I love. 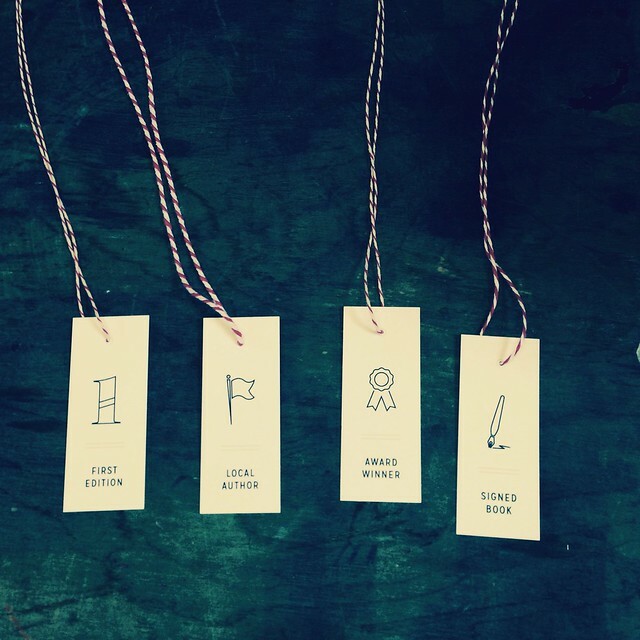 For some reason I really want to make a necklace out of the four tags Nate made for the store…they’re so cute! Love you!